If you attended Content Marketing World 2014, you probably attended a variety of panels that were delivered by people just like you. People just like you, except they had to write a presentation, stand on a stage in front of a room of people, and attempt to say something intelligent. Attendees are paying good money, so you need to bring your A-game or you won’t be coming back next year. I presented last year, but this year I pitched Joe Pulizzi something different. At New York Comic Con, I host one-on-one interviews live onstage. It’s modeled loosely on the “Inside the Actors Studio” with James Lipton. Joe liked it and asked who I’d like to interview. He was at the top of my list of top marketers. I mean, we know Joe from the stage, from the page, and from the microphone, but how much did we really know about the man in orange. I wanted to know who he was and how he formed his views. A few weeks later, Joe asked if I could do two interviews. Sure. Three? Um, okay. Three is manageable. I can fit three people in my car and nobody has to sit on the hump. Long pause…how about four? Four, one-hour interviews. On the same day. As considered the offer, Joe tells me that I’d get to interview him, Jay Baer, Mitch Joel, and Ann Handley. Suddenly I need a bigger car. I don’t want to pass on any of these interviews. In the coming months, I question the sanity of my decision. The amount of preparation required is daunting. Everyone has written multiple books, blogs, and articles. They’ve recorded podcasts, webinars, ebooks, and slide decks. They have complete presentations on YouTube. They’ve been interviewed dozens of times. They’ve answered every possible variation of every intelligent and inane question. They’ve seen it all and heard it all. If I was researching one person, I’d pace myself and enjoy the process. But no, I agreed to four. So, over the next few months I am reading, rereading, and listening to marketing audiobooks. I’m listening to marketing podcasts, watching marketing video podcasts, subscribing to marketing newsletters, and monitoring google news for press releases, interviews, and feature articles. I read a few hundred blog posts. I read tweets, review Instagram streams, and begin to wonder if there’s a thin line between journalism and stalking. When I take the family to the Jersey Shore, I am toting a stack of books, a small notebook, and hundreds of Post-It notes on marketing. Show time, and I’m up early. I hustle down to Room 26A with my Post-It notes. I’ve done plenty of presentations over the years, but this is different. You can practice a standard presentation until you know it. This is different. When you’re onstage with someone else, you don’t know what they’re going to say. This isn’t a rehearsed presentation. After the first question, it’s a full hour of improv…in my case four hours of improv. What if I screw up? What if people see the session and decide that it’s not interesting enough to actually attend? Will this be the last time I ever get invited to Content Marketing World? Will I offend four of my favorite authors? I’m concerned if I can keep my energy level up for four hours. I’m also concerned that — despite all of my preparation — I will mix up the authors. I don’t want to attribute a quote from one author to another one…in front of a live audience. Did I mention they’d be rolling video cameras as well? Yeah, that too. And then I hear my father’s voice. I’m 16 again and he’s dropping me off for wrestling camp to see how far I can push myself. To be tested mentally and physically by athletes older, stronger, and much more experienced than me. I’m about to see what I am capable of surviving. “If you can survive this, you can survive anything,” he’s telling me. He was right. I survived wrestling camp. As well as bungee jumping, bad relationships, political campaigns, car accidents, sports teams, intense deadlines, and a variety of situations that tested my limits. Most of it’s just overcoming mental barriers. I survived all of those things, so I know that I can survive this. I hear my father’s voice in my head and I am calm. This is just another personal and professional challenge (and it certainly isn’t physically dangerous). In the moments before the show, I get the usual pre-show jitters, but that’s mostly adrenaline and excitement, so I can handle that. Actually, there’s very little that I can’t handle. 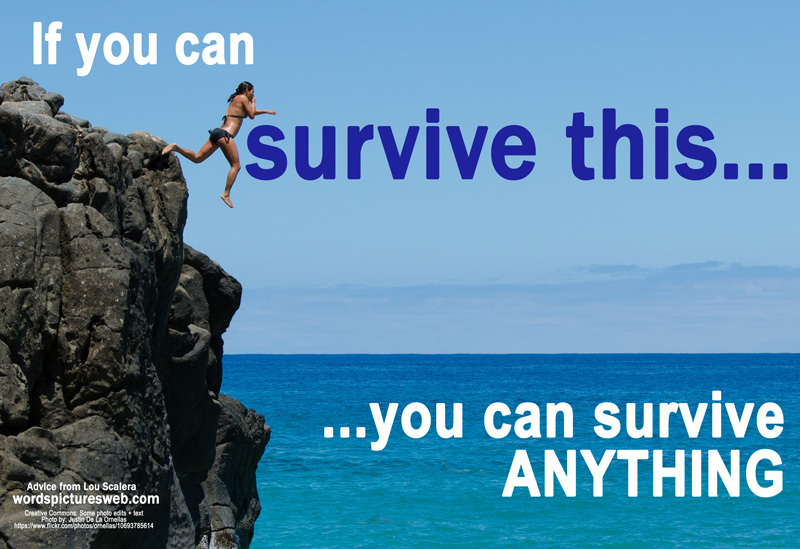 I’ve tested myself and know that I can survive almost anything. Any time I’m about to lose my confidence, I hear my father’s voice. He’s giving me the confidence to try harder and be brave. To push myself and take on challenges based on previous challenges I’ve already survived. This entry was posted in content, content strategy, Ideas, Marketing, presentations, Uncategorized and tagged ideas by Buddy_Scalera. Bookmark the permalink.